After running 44 of the 205 total miles at the Ragnar Relay from Lancaster to Mount Pocono, PA, my feet deserved a present! 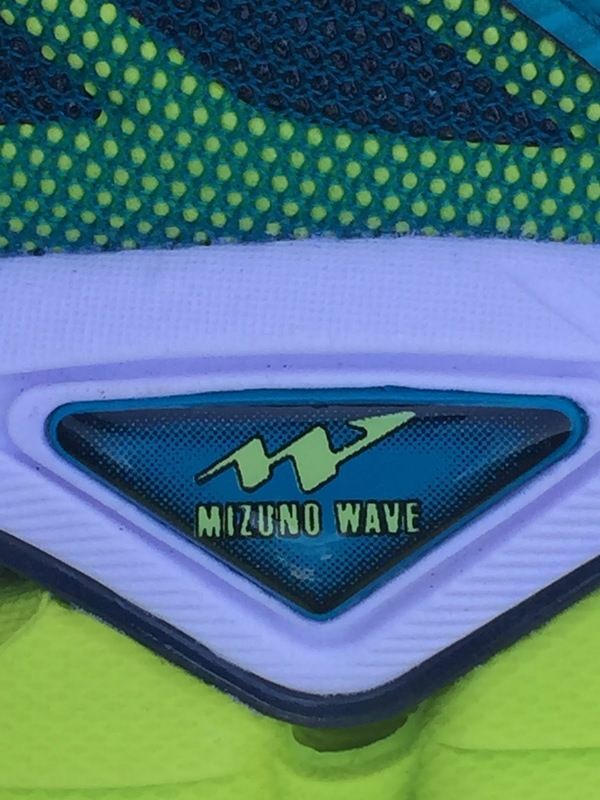 The Mizuno Wave Sky! The Wave Sky is a brand new sneaker from Mizuno that replaced their Enigma shoe. I have to admit I am an avid Wave Rider girl and always get a little nervous to try anything new! The first thing I noticed was how responsive the inside of the shoe felt. It truly felt like I was running on two clouds! 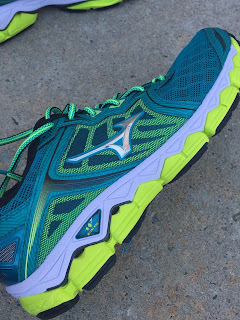 It is a very neutral shoe that can be used especially for marathon or high mileage training! 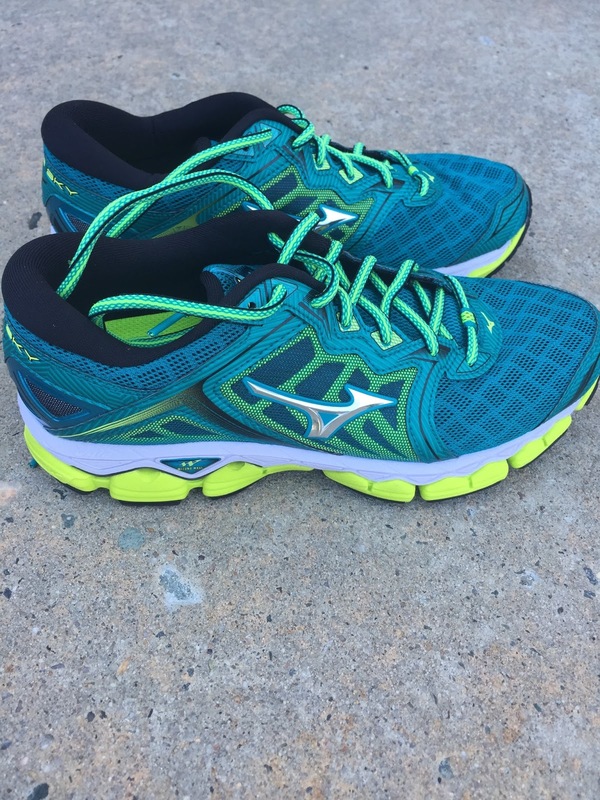 I feel my Wave Riders have a firmer sole, but the Wave Sky offers more cushioning and comfort! I noticed when I would strike, I felt a nice soft landing, and an immediate bounce back. 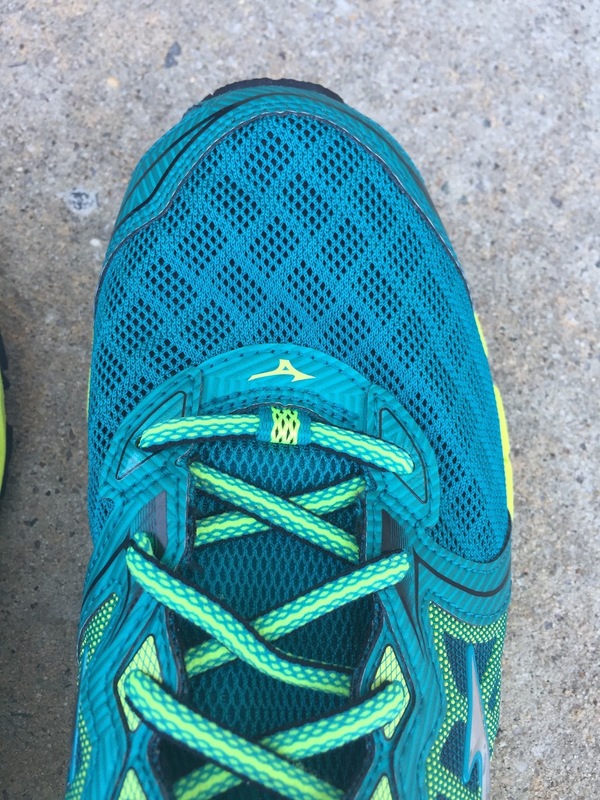 The Wave Sky felt like it was made for my feet ... a very comfortable yet not restrictive fit! 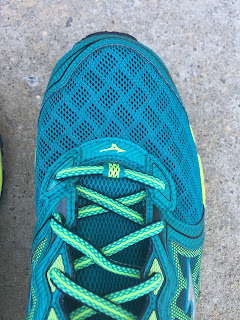 The toe box of the shoe gave me plenty of room and allowed my toes to have space and breath. I wear a women's size 10 and felt this was the perfect fit! With Fall marathon training right around the corner I definitely will be incorporating the Wave Sky into my higher mileage training runs! It weighs about an ounce more than the Wave Riders but I noticed a more responsive and bouncy feel with the Wave Sky! Another thing I noticed the most is it usually takes me a few runs to "break in" my new shoes but the Wave Sky felt amazing from the first step! Plus ... I am obsessed with the colors!!!!! 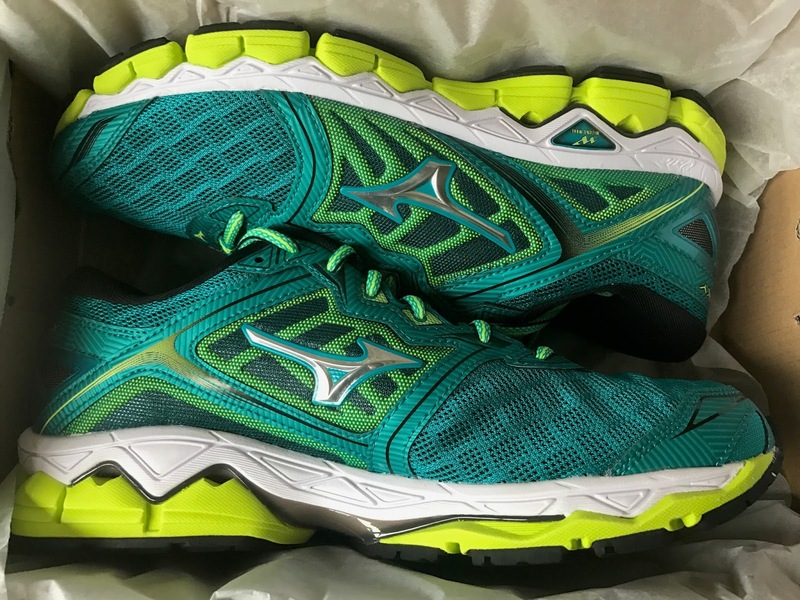 If you are looking for a new running shoe I highly recommend the Wave Sky! Added bonus they are Collins approved.... now if they just came in her size!!! This is a sponsored post on behalf of Mizuno and Fit Fluential. While I have received both products and compensation, all opinions are my own. Hellooooooo!!! Wowwee it has been a long time since I have actually had a chance to blog! Life is crazy wonderful right now. My crew sure does keep me busy....school, sports, practice, science Olympiad, Boston Marathon training and work = BUSY MOMMA! But I wouldn't change it for the world. So ... Recently I was the extremely lucky winner of a "Coaching Package" from McKirdy Trained!! THIS WAS THE BEST DAY EVER!! I honestly have to say this is a complete game changer! I tend to get caught up in overtraining/high junk miles but having a coach and weekly training plan has made me focus on purposeful runs! LOVE it and the challenge! If you are looking for a coach I highly recommend them! Now for something that truly takes me out of my comfort zone .... I have recently joined and fallen in love with the LipSense team! I first tried this product in November and was hooked after my first application! I am a lip gloss-aholic and constantly carry mine with me where ever I go. When I do races I carry some in my fuel belt and reapply throughout my run.... I cannot stand my lips to be dry and after I finish my runs/races my lips tend to turn a little blue! I have had people comment on them and ask if I was "ok?" ... 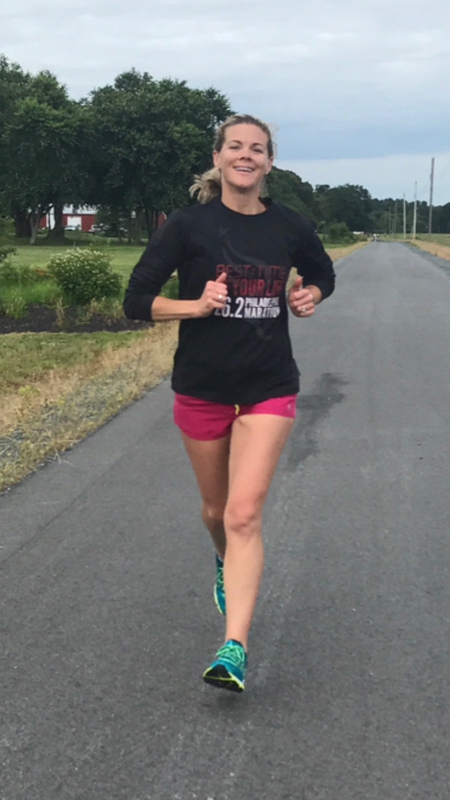 SO when I did the Rehoboth Beach half marathon in December I tested out my LipSense! I have to say I love my finishline and race photos! Its the little things people!! Also, being a busy mom of 3 littles ... I really do not have a lot of time to put myself together in the mornings ... This is why I love this product!! I literally apply it first thing and then do not have to think about it for the rest of the day!! I can snuggle and kiss my little ones and don't worry about getting lip color on them ( my boys would be mortified if that happened )! I can go into my night shift and still look fresh plus the color DOES NOT come off into my OR mask at work! Bonus!! I could go on and on about the reasons I decided to do this but ultimately it is because I ABSOLUTELY love the product! I am nervous and excited for my launch party tomorrow! Normally my oldest son says for me to go do things or he doesn't care if I miss a game .... but last night he begged me to be there for his BIG lacrosse tournament this weekend!! How could I say no to that?? Also... I have full trust in my hubby and his parenting skills but to managing all 3 littles out at a lacrosse tournament over 2 hours away both Saturday & Sunday is a lot to handle! Plus, Collins still needs me and still does NOT like a bottle!! The breastfeeding alone was the biggest deciding factor....In my mind if I went and had to pumping 6-7 times a day, then store my milk, and worry if she would nurse when I got home a few days later gave me a TON of anxiety!! I know my teammates would have supported me in ANY decision and would have helped me through the anxiety and stress but right now at this moment in life I feel my little crew here in Delaware needed me the most. I may cry a few more times and be uber jealous seeing all the pictures and fun ....but in my heart I know I did what was best for my family! I am SOOOOOO excited for my fellow Delaware ( and ALL other states ) birds to experience this LIFE changing camp and cannot wait to get together with them when they get back to hear all about it!!! Right now I am going to go snuggle my little girl with the windows open and listen to the wind blow! Head Up Wings Out Campers!! And a HUGE THANK YOU goes out to Rebecca Trachsel and Ashley Fincher for their support and organizing of Bird Camp!!!! The two of these girls are amazing!! The positivity and energy they have is something special. Thank you for the memories and laughs girls!! And always having my parents and husband there to support, believe, and push me is priceless! We meet up with Dave, John, Jenn and Teresa at City Bar for a celebratory drink! Cheers!! My "middle little" could not wait to get his hands on his baby sister but my oldest just wanted his momma!! MELT MY HEART!!! I had to go to work Tuesday night at 11pm ....SO no rest for me! Work was crazy busy but I think this helped with my recovery! I definitely wore my Feetures compression socks to run around our crazy unit! I actually went for a short 2 mile run on Wednesday with my lacrosse team and was pleasantly surprised that everything felt pretty good! My quads had been pretty sore on Tuesday morning but that all was gone by Wednesday! I decided to run 3.1 miles on Thursday and then met my BFF to walk 3.5 miles with Collins! Again...everything felt good! I went out yesterday to run with no real plan for distance or pace ... I wanted to take the baby with me but my jog stroller is NOT made for distance runners! I have had the toughest time trying to maneuver it and find that it is more of a hazard to use! It has definitely thrown off my gait and my right shoulder is not a fan of steering it!! UGH! Suggestions or recommendations are welcomed!! So I laced up and went out solo ... 6.2 miles in 45:02 .... GO LEGS! 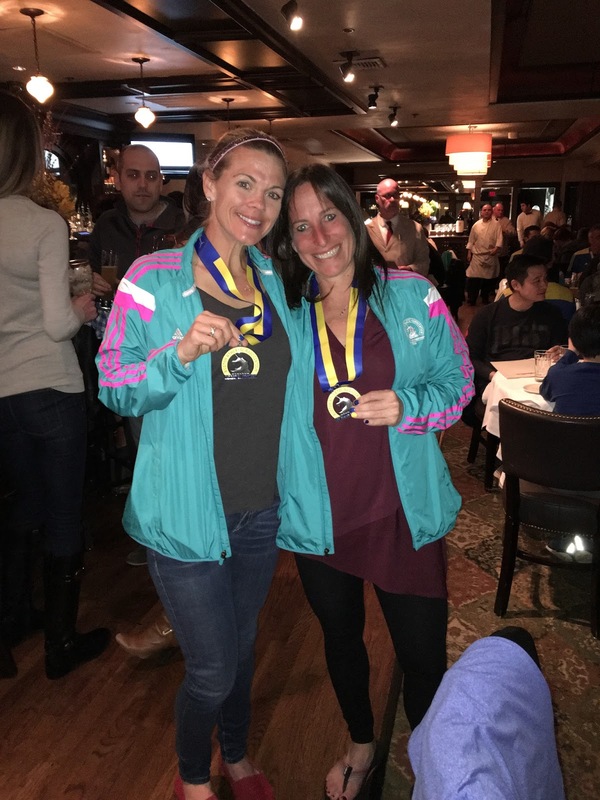 Huge congrats goes out to all the Coastal Marathon/half marathon/9k finishers yesterday!!! HUGE congrats to all the Boston to Big Sur finishers!!!! What jog strollers do you use or have you used?? How do you recover from a race? Thankfully Collins let me sleep and I fed her around 6 am before I got ready to head to the buses at Boston Common. Our hotel, The Lenox, is amazing and they had a great selection of race day breakfast foods and my morning essential...COFFEE!!! I had 2 cups of coffee, a cup of oatmeal with honey, a bottle of watermelon Nuun and a bottle of water. A quick pit stop in the potty and off we went to catch the buses. Thankfully this year I had bus buddies!!! Laura and Teresa are amazing, talented and calming women! We saw John at Athletes' Village!! Laura, Teresa, Me and John!! As we were standing in the port-a-potty line I ran into a Oiselle teammate!! She was the exact person I needed to see at this moment..... 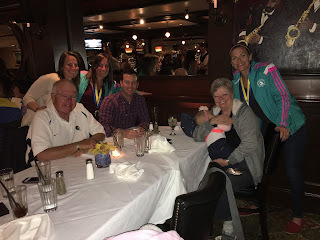 I was super anxious about the race and questioning my abilities and concerned about breastfeeding ... Connie was awesome!! 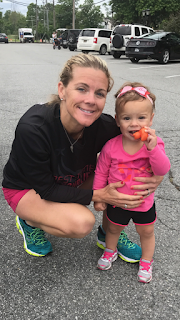 She reminded me I can do it and that the shortest, quickest way to my baby girl was to run the course!! Another reason why I LOVE Oiselle!!!! I made my way to the Operations tent and pumped one final time before we walked to the start line! A HUGE shout out to the B.A.A. on being so "Breast Friendly"!! Just think 50 years ago women were not even allowed to run the Boston Marathon...Now they are supporting woman who are nursing and providing us with a safe area to pump, hydrate and use the port-a-pot! THANK YOU B.A.A!! We then had a brisk almost mile walk to the start... one final pit stop, another cup of water and to our corral Teresa and I went! Laura was 3 corrals behind us. The gun went off and it was go time! I set my watch to only see my mileage and not my pace...I was so nervous I was going to stress over my pace and allow the negative thoughts to attack! I was worried when I hit the 10k mark because I was already salt covered and feeling pretty dry! I decided I would walk the water stops and make sure to grab a drink at least one cup ever 1-2 miles... I also did my first gel at the 10k mark! This strategy seemed to work pretty well. I saw so many Oiselle teammates out on the course and cheering their heads off for us runners!! I told myself to just get to Wellesley and to Cowbell Corner where my AMAZING Oiselle cheer squad would be!!! They did NOT disappoint!! I could hear the screams and cheers and it was exactly what I needed to fuel me to the Newton Hills!! I took another gel at 13-13.5 miles. I wanted to scream, cry, laugh ...all at once!! My mom shout "Go, Go, Go" ... So I figured I must be close to my BQ time!! 3:36!!! I DID IT! I re-qualified for next year!! Just a quick recap of the past few days here in Boston!! We are staying at our home away from home.... The Lenox ! I cannot speak highly enough about this hotel and the incredible staff and management!! Dan Donahue is fantastic and truly goes above and beyond! Sid and Pete are like family and make magic come true! Jenn killing it in her Oiselle singlet! We then went straight to the expo and packet pick up!! OH MY GOODNESS this is really happening: PHOTO overload! I had an amazing lunch with Feetures runners and the BEST Mary Mac!!! A girl and her Poppop!! Started Sunday with a nice Oiselle meet-up and shakeout run!! I love my Oiselle sisters and the bond that we share!! Jessy and I are both 6 months postpartum!!! After my run we went to Saint Cecilia's for mass and blessing of the athletes! Two of my biggest fans!!! I am very sad my boys are not here to share in this amazing weekend with us but school and their sports keep them busy!! Good luck to all the Boston marathon runners!!! !